From the Alvina Treut Burrows Institute, an important collection of critically reviewed reading research, the 900 references are indexed by author and subject. It also includes a bibliography of all research reviewed. Annotated author, subject and citation indexes on cards are filed before the microfiche. The index is located above the microfiche cabinet. Books in A. S. W. Rosenbach's Private Collection of Historical Children's Books. The indexes are located above the microfiche cabinet. 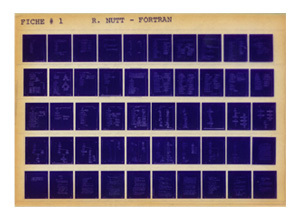 The Opie Collection on microfiche covers the 16th to 20th century and is the richest library of children's literature. This collection is organized into units by book type. The collection is particularly valuable to students of literature, history, developmental psychology, linguistics, sociology, early childhood education, and related disciplines. Bibliographic access is provided for each unit, and a cumulative index is planned upon completion of the collection. The collection preserves early chapbooks, battledores (two or three-page primers), and card-covered toy books; comics, children's magazines, and penny dreadfuls (Victorian serials for children); and bound volumes of children's stories and nursery rhymes, books on games and amusements, picture books, movable books, reversible books, rag books, miniatures, and other items. The title are listed in the TWUniversal Catalog or brown here. A collection of 10,000 titles of research on reading topics assembled by William S. Gray and other specialists from journals, books, research reports, and other monographs published between 1884 and 1989. The collection is based on the Annual Summary of Investigations Relating to Reading and published in various places since 1900. It is accompanied by annotated author/chronological and subject indexes on cards filed before the microfiche and author alphabetical and category indexes in a binder, which also includes an introduction to the collection.